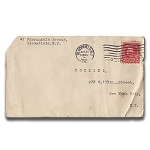 Own a piece of magic history! 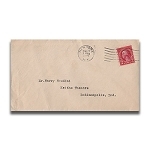 Genuine authentic magical memorabilia, items once owned and handled by famous magicians! 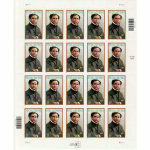 Many of these items are one of a kind, and some are extremely hard to find. Have a favorite magician? Here's your chance to own a piece of magic history! 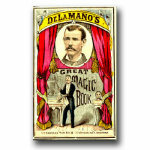 Incredible antique hand-tinted souvenir book, with magic tricks! 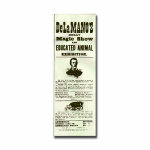 Wonderful broadside advertising 19th century magician De La Mano and his Educated Pig act! 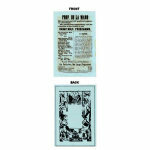 Authentic broadside advertising 19th century magician De La Mano as the French Magician! 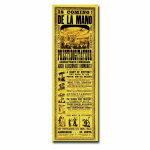 Real 2-sided handbill advertising the 19th century travelling magician De La Mano! 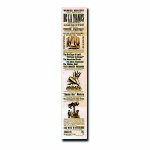 Impressive and authentic oversize broadside advertising 19th century magician De La Mano! 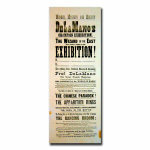 Authentic broadside advertising 19th century magician De La Mano- Wizard of the East! 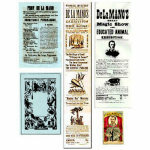 Authentic posters, handbill and souvenir book from the show of travelling magician DeLaMano! 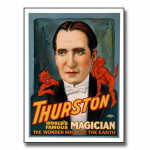 Rare fine art reproduction of a classic 1925 Thurston magic poster! Rare and authentic tabletop statue from 1877, depicting a performing traveling magician and his astonished spectators!